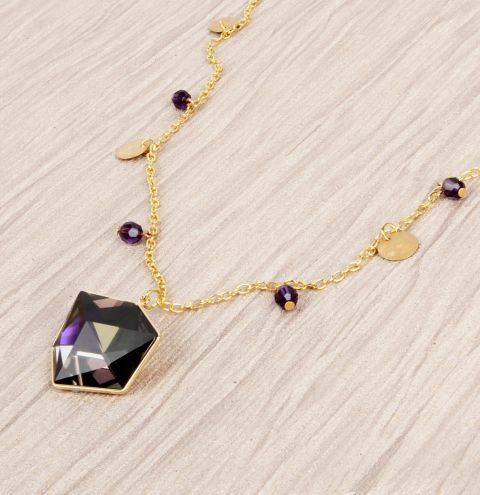 Make yourself a stunning adjustable necklace with a beautiful gold and purple colour combination, using new NEW coin charms and Swarovski crystal dice fancy stone for a bohemian look! Fancy changing the colours? Choose from more crystal dice fancy stones HERE. Choose your 6mm crystals HERE. Begin by cutting a length of chain to 14.5 inches (36cm). Find the middle and attach the crystal setting to a link in the chain using a jump ring. Take four crystal rounds or bicone beads, put them each on a headpin and create a loop. Take two more beads, put them on an eyepin each and create a loop at the end. Attach your first two crystal beads approx. one inch (2.5cm) away from the centre so they sit on either side of the crystal setting. Take two coin charms, open a jumpring and attach them both to either side of chain, approx. 1.5 inches from the crystal beads you just added. Add another two crystals 0.75 inches away from the coin charms, and then another pair of coin charms 2 inches from the previous crystals. You should have about 2 inches on chain remaining at the ends. Take your two eyepin crystals and attach them to either ends of the chain with a jumpring. On the left side of the chain, connect a new piece of chain 4 inches (10cm) long to the eyepin crystal using a jumpring. On the end, attch a lobster clasp with a jumpring. On the opposite side, you will create a piece of chain with two jumprings at the ends to make your necklace adjustable, and have an alternate, asymetric look. To do this, cut three new pieces of chain, 3 inches, 1.5inches and 1 inch in length. Attach 1 jumpring to the eyepin crystal and then link this to the 3 inch piece of chain. Add a jumpring to the end and attach another jumpring, followed by the 1.5 inch chain. Add another jumpring to the end and attach the 1.5 inch chain. Make another looped crystal bead on a headpin and attach this and a coin charm to the end of the chain with a jumpring. Apply a thin layer of Gem-Tac glue to the setting and carefully set your crystal into place. Allow the glue to fully dry (up to 24hours) before wearing your necklace.